For centuries, water was considered to be something sacred, which hides a lot of magical powers. To this day, despite countless studies and experiments, it is still inscrutable phenomenon of the nature. Even scientists say, that water not only has a lot of medicinal properties of which can be used appropriately, but also has a memory and behaves like a living organism - a very intelligent organism. Probably, if we could understand this phenomenon, it could help us to keep our health and youth for many, many years. However, even based on todays knowledge about the water, everyone of us can obtain perfect health just by drinking water, especially if it has healing power like Ting Nam water. According to Tibetan tradition, water is one of the five elements that organize human life and is extremely important, not only because of its natural need and necessity to keep life on. Water is playing more important role in the Universe, than we think! There are popular Tibetan practices for personal development and they all consider the positive aspects of water because such practices encourage love. As we know, love in the general sense is the foundation of harmony and harmony is the foundation of health. Based on biblican symbolism of Christian religion, water attributed to the nickname of "living water" and was commonly compared to the Holy Spirit. That is why the water is used by the priests in Baptism ceremony, which according to religion, purifies the human soul. This proves, that the water is a carrier of information which can modify the invisible fields of energy in human holistic structure. Japanese scientist Dr Masaru Emoto has already proved, that water stores and transmits information generated by the words, sounds, feelings, intentions, thoughts and even human emotions. This means, that the water has some kind of consciousness! I am positively convinced, that water is the most important key to maintain the perfect health of human body and we do have the ability to program it according to our intentions. Human organism is practically made of water. Almost 70% of body weight and more than 80% of the brain is the water, which carries information on the energy level of the human body using neurons . People with pure, untainted of negative emotions thoughts and intentions, are able to program the water with specific and targeted healing information, what has been altready scientifically confirmed too. 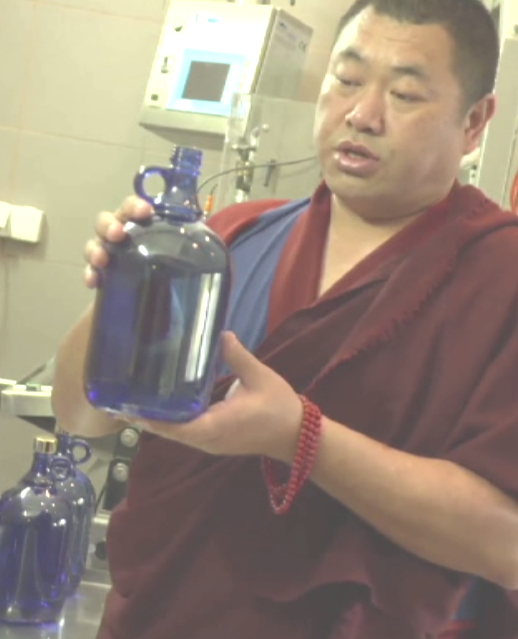 Tibetan lamas and monks, especially from the Bon tradition are known for thousands of years, that they can make healing water from the ordinary water, just by chanting mantras. Also the water from Lourdes spring in France has healing propeties just because being programmed by thousand of prayers daily. The Blessing Ceremony of the Precambrian water source located in Jelenia Struga Medical SPA along with giving the water name of Ting Nam, was held on May 9th, 2015. From the moment of that Blessing, the water have power to heal body, mind and spirit of everyone who drink it with true intention and faith. The Ceremony was conducted by Tibetan Bon lama, His Eminence Chongtul Rinpoche, with assistance of his special guest from Tibet and Ting Nam Project initiators.